Patagonia says:"The pullover that made fleece famous, made of warm and durable Synchilla™ heavyweight polyester fleece with our classic Snap-T® pocket and placket." 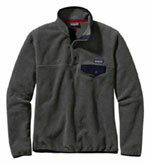 The Patagonia Lightweight Synchilla™ Snap-T® Fleece Pullover is a stylish, everyday, warm and functional fleece. I've been wearing it on its own as well as part of a layering system depending on the conditions. However, it is not a technical product and whilst it will definitely keep your body nice and snug when relaxing in on a sunny spring, autumn or winter day around the campsite, hostel or bunkhouse, it is not very breathable nor waterproof. And while it is lightweight, it is too bulky to carry in your rucksack or backpack as a spare layer just in case the weather conditions take a turn for the worst. There is one chest pocket with a popper fastening that will accommodate a phone and some money/credit card but not much else. It is certainly too small to carry an OS Map. The Patagonia Lightweight Synchilla™ Snap-T® Fleece Pullover has a high collar that can be poppered up under the chin to keep your neck warm and out of the wind. And if you overheat, you can unbutton the front opening down to the middle of your chest. The fit is relaxed and generous with plenty of room for a base layer, but you cannot adjust the fit around the neck or skirt. The back is quite generous and deep and will cover the majority of your lower seat. I had a a Nickle coloured fleece with Hunter Green trim, which is nice, but there are some much wilder and wackier colours available and if you are thinking of buying one you should check them out. Like all of Pantagonia's products the Lightweight Synchilla™ Snap-T® Fleece Pullover is well made and produced under safe, fair, legal and humane working conditions throughout the supply chain. Furthermore, Pantagonia gives 1% of their sales to support environmental organizations around the world, funding at the grassroots level in countries and communities where they have people on the ground. Check out the Patagonia website for more details. Stylish, warm and functional, the Patagonia Lightweight Synchilla™ Snap-T® Fleece Pullover is a good quality mid-layer ideal for low level walking or for keeping warm on rest days around the campsite, hostel or bunkhouse - and looking rather stylish while you are doing it.